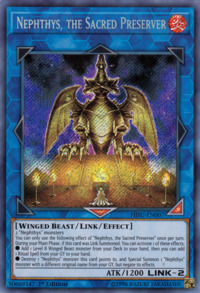 ● Add 1 Level 8 Winged Beast monster from your Deck to your hand, then you can add 1 Ritual Spell from your GY to your hand. 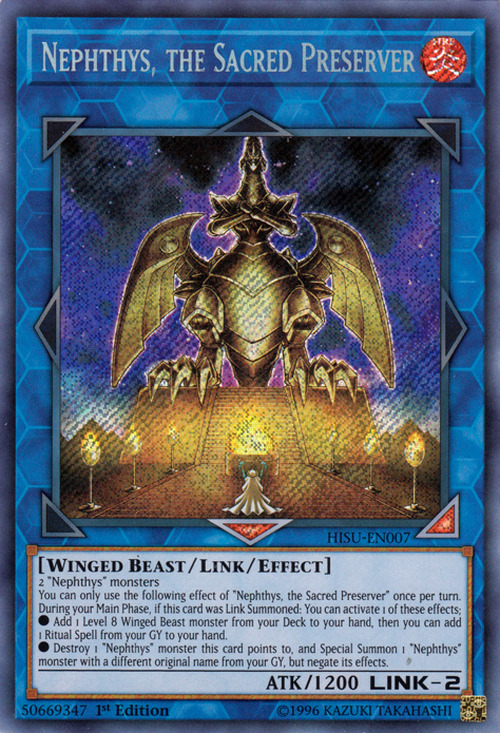 ● Destroy 1 “Nephthys” monster this card points to, and if you do, Special Summon from your GY 1 “Nephthys” monster with a different original name from that monster, but negate its effects. You can only use each of the these effects of “Nephthys, the Sacred Preserver” once per turn. Matriarch of Nephthys is seen in this card's artwork. This monster appears to be the sealed form of Cerulean Sacred Phoenix of Nephthys.